On 17th January, 2000, three children were left in the care of a nanny in a brickbuilt house in Maputo, Mozambique. Michella Dinis Timba, daughter of Dinis Ernesto Timba and Josina da Conceicao, was two-and-a-half years old. Her sister Lucia Dini Timba was five years old and her cousin Katia Antonio Sono was three years old. The children are believed to have taken matches to play with in a bedroom. They locked themselves in. Neighbours raised the alarm when they saw part of the house on fire. Michella and Lucia's parents were at work. For two of the children it was too late, but Michella survived. Michella is called Mimi by her family. She was burned on her face, ears, arms, hands, neck extending chestwards into a bib shape, stomach, and on part of her legs. She has had extensive skin grafting with the crocodile-style finish to cover large areas, at the Centro Infantil da Banca Estatal. Mimi's face would benefit from further surgery but it would be complicated. Her mouth cannot smile properly nor open fully. She could maybe benefit from use of transparent plastic masks as used by Colin Haylock at Charing Cross Hospital in London, UK. When she is older (maybe nine years old) her ears could be reshaped with cartilage. Mimi is quite overweight and spoiled by loving parents who cannot cope and who have received no counselling for their bereavement, let alone for how best to help their surviving child. They wait on her hand and foot. Mimi had pressure garments but didn't like wearing them so her parents did not persist. They do not think that they will fit any more. Much of her scarring is probably permanent because of the time delay in helping her properly. Action should ideally be taken within two years of the injury. No surgeon or doctor has taken Mimi under their wing and made a plan for her future long term surgery and therapy. The parents did not know where to turn for clear advice. The family mostly understand Portuguese and would need counselling in that language, although they have some Zulu-speaking relatives. 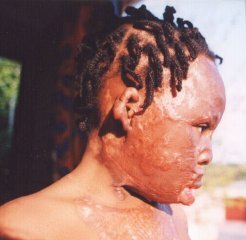 Mimi was seen by Dr A Kadwa at the Park Lane Clinic in Johannesburg in late September 2001 and in early October 2001. She had a skin graft to the left hand with skin taken from the buttock. She also had lip contractures released. There seems to have been no followup since October 2001 and the lack of attention and family knowledge has resulted in a lot of unneccessary damage. Mimi's family contacted Children of Fire for help in August 2002. She then visited the offices in Auckland Park with five relatives. Mimi was wearing a bandage on her left hand on September 1st, 2002. She was reluctant to have the bandage removed and underneath it became clear that there was no need to wear the bandage; in fact it was causing her harm. Mimi has contractures to the left arm at the elbow and the armpit. Her hand is badly malformed. An occupational therapist should have been involved early on and much better splinting of the hand should have taken place soon after the injury. It is hard to tell what can be salvaged now as even the fingernails are there but the fingers are fused and shortened -- compressed almost and have not been used for a long time. Mimi cried when we threw her bandages into the bin. 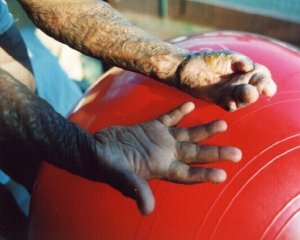 Her mother said Mimi liked the hand to be swathed because she found it too ugly to look at. We said the hand must not be concealed but that it should be used. Her father seemed to cringe away from the sight of it, which makes Mimi's self-loathing easier to understand. Mimi holds her left arm like a sparrow with a broken wing but when I gently massaged it with Vitamin E creams, she unwittingly relaxed and the contracture seemed to be less severe than it had at first appeared. She would not actively use the left hand but when I encouraged her to rub cream into the opposite arm, she used her left forearm a little. Mimi can raise both hands above her head but the arms are not fully extended. The arms are easily crossed at the front but if she puts them behind her back, her movement is again restricted. I asked her to undress herself. She has clearly not done this since she was injured. She could not undo dungaree-like buckles on her pinafore dress but eventually managed one of them. She struggled to remove a T-shirt and dress, but took socks and shoes off fairly easily. Putting socks back on was much harder and she did not want to do it. She could not manage the buckles of her sandals at all. Despite putting her socks on inside-out, I gave her a floral animal mug as a reward for trying. Mimi also received a doll, a special non-wood pencil, some vitamin e cream and a book about Snow White and the witch. I said to Mimi that she should direct her sadness and anger at the witch, because everyone else in the room loved her and did not want to cause her pain. I referred the family to Dr Gavin De Aguiar at Milpark Hsopital as he specialises in hands (though he assisted us before with surgery on Mfundo's head). I also suggested that they should talk to Janet Bydawell, the occupational therapist, about thermosplastic splinting. Mimi's mother in particular will struggle not to spoil her child, even wiping the little one's nose when she cries. Children of Fire offered to take Mimi occasionally for one week at a time, to give the parents a break. Mimi's relatives commented in Zulu: 'If she can come right, she'd come right here.' The family will arrange what surgery they can, and the charity will continue to assist with advice and, if need be, assistance with operations as well. Bronwen Jones, Johannesburg, Sept 2002.